No horrifying pictures, no ridiculous comments, no guilt trips, no hyperbolic “THIS ANIMAL WILL DIE UNLESS YOU DO SOMETHING NOW!!!!!!! !” nonsense. Just the facts, folks. A few days ago, I went to the gas station to fill up my nearly empty tank; I purchased a little under seven gallons for a little under twenty-five dollars. Did you read that twice? Three times? Are you now wishing you had and feeling guilty about skimming my amazing blog? No worries. My tank holds about eight gallons, and NC gas is expensive. But here’s the awesome part: I drove two hundred and ninety miles on those first seven gallons. How’s that for a fun math problem? “Heidi,” name courtesy of D.T. 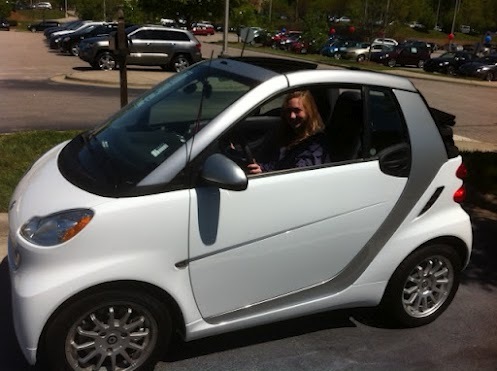 It’s a Smart Car!! Made by Mercedes, it’s quite safe– this little thing has eight airbags and extraordinary safety ratings. The best part (yes, it actually gets better) is that neither Drew nor I had to give up our huge SUVs. After running the numbers, we found that driving this car really does pay for itself! I use it almost every day between Durham and Chapel Hill, and Drew occasionally drives it to Raleigh. Yes, dear readers– my 6’6″ husband fits comfortably in the smart and loves driving it. With an automatic clutch and a manual transmission, the car can be driven in regular drive, with a stick, or with paddles on the steering wheel. So, what brought two professional students to buy a third car? As many of you know, I teach my “Writing in the Sciences” unit on climate change because the research is new and relevant. Regardless of political leanings, students seem invested in finding out the truth the hard way– reading the studies that pundits and reporters so often oversimplify. And, perhaps to Fox’s chagrin [see their and Mediaite’s laughably one-sided reports on a one-sided study about college professors being one-sided here], I have no social agenda to put forth. What’s so fascinating about teaching this unit is that I see dozens of articles on climate change, and not all of them agree. Despite the surprisingly heterodox treatments of climate change by legitimate scientific resources, I was ultimately swayed by the preponderance of evidence that gas emissions do indeed contribute to catastrophic, climatic effects. I felt good about my perspective because I’d read credible sources from other sides, but then I became a little panicky. How could I be so complicit in something I knew was wrong, especially when there was an alternative? I couldn’t. I don’t believe in promoting a personal agenda in the classroom, but I do believe, very strongly, in leading by example– inside and outside the classroom. If I know something is wrong and I have the opportunity to make a difference, I should. That’s not politics; that’s personal responsibility. Studies like the one reported above miss the fact that most teachers enjoy learning from their students. If “college campuses [are] dominated by liberal professors– some of whom may be pushing a progressive agenda on their students,” what should I do about being a moderate instructor influenced by the research of my students? Have they come to college to indoctrinate me? It’s a rough world of knowledge out there, friends. Stay smart. This blog, as its name suggests, is about home and school. I grew tired (read: embarrassed) by flooding the fb newsfeed, so I decided to take the leap to posting on a site that is explicitly about my life and interests. So, onward.